An American BBQ joint, an ex-Captain America artist and a shower beer blogger walk into a brewery. No, really, they did and the result was no half cooked idea or rush at opportunism. Instead, Walrus Tears is a poised lemon and rosemary gose that celebrates the flavours of low and slow cooking. The collaborators discussed creating a beer that would enhance the dining experience and settled on the gose style to balance the richness of Perth restaurant Old Faithful's menu. Salt levels for the beer were reduced to balance the brining elements of the meat as well as the acidity of the 20kg of lemons used, some of which were roasted with 200g of rosemary to add extra depth. A further 300g of fresh rosemary add a herbal note to the aroma (not to mention alarm to the Feral brewpub’s chef as they watched a month’s worth of garnishes disappear into the fermenter). As ever, the intuitive balance brewer Will Irving brings to his Swan Valley experiments shines in an immensely drinkable beer that complements and cleanses the palate with candied and preserved lemon. The idea of using lemon and rosemary seems obvious when pairing with chicken and pork and, after extensive research (to ensure journalistic integrity, of course), this writer can confirm the 12 hour smoked beef brisket and specialty gose is a celestially blessed coupling. The finish on this culinary inspired collaboration is one of the most amusing decals of 2017. 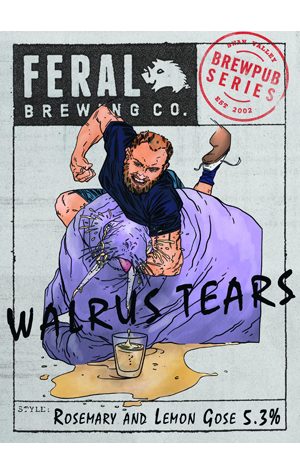 Drawn by Old Faithful owner Rob Paolucci, who previously worked on Captain America comics, the caricature of departing Feral WA sales rep Seb Levy wringing the essence of this beer from Old Faithful team member and shower beer reviewer, The Walrus, ensures not everything in this collab is confined to your glass.